People always talk about the bad wigs in Hollywood – we want to focus on the positive. After all, it’s such a pain-staking process to produce a wig, especially for film or TV, so we want to honor those who have pulled off movie wigs so well. In the high-budget films, the producers have the luxury of having the actors just grow out their hair (or the opposite, like Demi Moore shaving her head for G.I. Jane). And we say, all the power to them! But this takes time, something not all budgets have. Others have ongoing commitments, like the actress who had a contract with Pantene that required her to keep her hair long. Instead, they’ll have a wig made for them to slip in and out of. For our short list, we chose the movie wigs that are so natural-looking that, if you were asked to choose, you would assume they were real! We’ll start with the movie wig that’s regarded as one of the most famous in film history. Beautiful black bob with braided locks, held with golden beads. 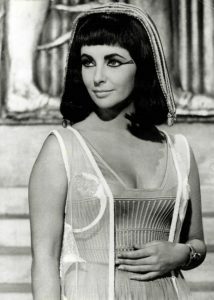 At the time, Cleopatra was the most expensive movie ever made, and her wig was made by Stanley Hall, who did all the wigs for the movie. Here is the amazing fact: at a recent auction, the wig was sold for $16,000! We included this wig because we were floored when we found out it wasn’t her actual hair. Reason is, at the time Rachel McAdams was also filming The Notebook, for which she needed shorter hair. And Regina King (the character she plays in Mean Girls) cannot have blond hair that isn’t long, blond and flowing! 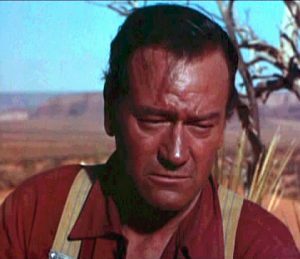 Yes, the Duke wore a wig for the majority of his career. We love his response, when asked about the movie wigs, “It’s not phony. It’s real hair. Of course it’s not mine, but it’s real.” These hairpieces were at the behest of the studio, after his hair started thinning. Stories say he was quite proud of being bald. We aren’t surprised! While it’s not his most famous movie, and it’s far from being his best one, we included Marlon Brando’s hairpiece from Island of Dr. Mor`eau for this fact – it was upside down in the whole film! In an LA Times interview with the wigmaker, Bert Kerstchmer, he says, “I made this beautiful wig. And he decided one day…he just turned it upside down and plopped it on his head. He said, ‘That’s the way I want to wear this wig’”. Fascinating! Truth is, many more actors wear wigs in their films than would meet the eye. It goes unnoticed due to the excellent skills of Hollywood filmmakers. Many of these movie wigs have become icons now, and are the key piece to a great costume. Dress up with something from our wig selection in the McMinnville and Salem, OR areas – we’ll have you looking like the stars!